ROS are produced by various biochemical and physiological oxidative processes in the cell. Mitochondria and nicotinamide adenine dinucleotide phosphate (NADPH) oxidase are the two major producers of ROS [25, 26]. ROS were once viewed merely as by-products of cell metabolism, but subsequent research showed that they have many roles in normal physiology. ROS serve as an important signaling molecule participating in a variety of cellular signaling pathways such as growth factor pathways, inflammation, engagement of integrins and adhesion to the extracellular matrix [27–30]. Apart from cancer cells, various tumor-associated cell types also produce ROS and contribute to the oxidative microenvironment. Cancer-associated fibroblasts (CAFs) are one of the most abundant stromal cells in the TME and influence the pathology of cancer in many ways [39–41]. As CAFs is a cellular state rather than a cell type, CAFs are generally known as activated fibroblast in the TME with no precise molecular definition . CAFs produce and are highly influenced by ROS . CAFs have been shown to have an elevated level of H2O2 as compared to normal fibroblasts. The high production of intracellular and extracellular H2O2 by CAFs was due to impaired transforming growth factor beta (TGF-β) signaling [44, 45]. This impaired signaling leads to the suppression of the antioxidant enzyme GPx1 as well as the production of intracellular ROS by impaired mitochondrial function and extracellular ROS by induced NOX . In addition, Caveolin-1, a negative regulator of NOX derived ROS, also increases the level of extracellular ROS production by CAFs . Notably, normal fibroblasts treated with exogenous H2O2 or CAF-conditioned medium transformed into an oxidative, CAF-like state . These newly transformed fibroblasts displayed elevated fibroblast activation protein (FAP) and α-smooth muscle actin (αSMA) expression levels, both of which are biomarkers of CAFs. Similar to CAFs, newly transformed fibroblasts became activated and desensitized to TGF-β. Normal fibroblasts treated with prolonged exogenous H2O2 displayed a significant increase in p65-NF-κB phosphorylation, triggering NF-κB activity. The NF-κB activation attenuated TGF-β signaling and hence, ensures the continued expression of FAP in the newly transformed fibroblasts . In addition to CAFs, ROS are also released by many tumor-associated immune cells in the TME . Tumor-associated macrophages (TAMs) in the TME mainly originate from blood-circulating monocytes that infiltrate into the TME and differentiate into mature pro-tumor macrophages mediated by cytokines in the TME [49–51]. Interestingly, the role of TAMs is a double-edged sword. As part of the immune system, macrophages are the first host cells to enter the TME and can potentially kill the cancer cells . In vitro, activated macrophages showed anti-tumor activity via calreticulin binding receptors for cancer cell recognition . Macrophages also display phagocytotic activity toward some damaged tumor cells . However, the TME is known to have elevated levels of macrophages. During cancer initiation, cancer cells recruit macrophages via chemokines which amplify an inflammatory response. 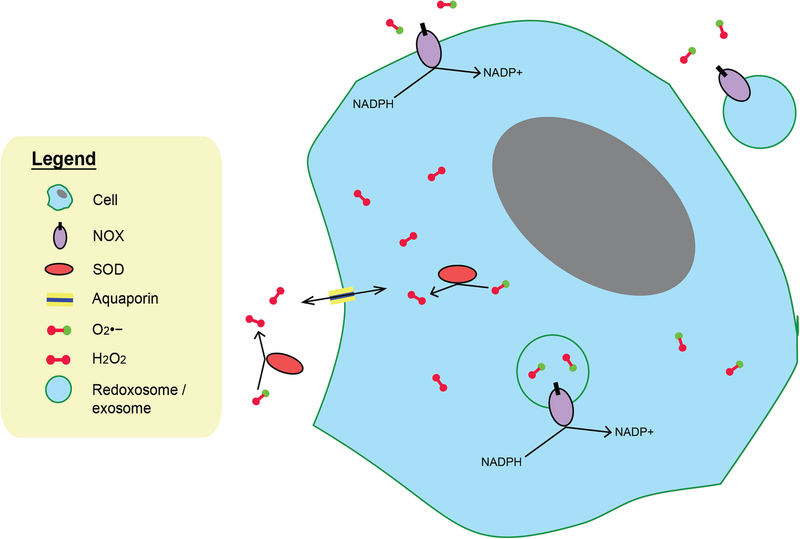 Macrophages also produce redoxosomes, i.e. exosomes containing functional NOX complexes into the TME, generating extracellular ROS and being incorporated into surrounding cells via endocytosis . Myeloid-derived suppressor cells (MDSCs) also promote cancer progression via ROS . MDSCs are a heterogeneous population of cells which can suppress T cell responses and expand during inflammation and cancer . These cells were first observed in patients with cancer [64–66]. Apart from their immunological functions, MDSCs were also reported to promote tumor angiogenesis, tumor cell invasion, and metastasis . MDSCs are a unique component of the immune system which regulates the immune responses in cancer patients . Indeed, up-regulation of ROS primarily by NOX is one of the major factors responsible for the immunosuppressive activity of MDSCs . Granulocytic MDSCs, a subpopulation of MDSCs, were found to use ROS primarily as the mechanism of immunosuppression by close cell-cell contact with T cells [69, 70]. Field cancerization was first reported in 1953 by Slaughter et al. and is often used to describe the development of abnormal epithelia and stroma bordering a tumorigenic area . This posits the presence of a regional carcinogenic signal at these foci of cellular abnormalities, and if given enough time and exposure, the carcinogenic agent will cause irreversible changes to the cells leading to oncogenic transformation and field cancerization. Indeed, field cancerization results in multifocal primary tumors in proximity with a higher chance of recurrence even after resection of the malignant tumors . Presently, field cancerization basically refers to pre-malignant changes in multiple and large areas of the primary tumor, within both the epithelial cells and surrounding stromal cells [75, 76]. Despite its clinical importance, only a few cytokines such as TGF-β, macrophage inhibitory cytokine 1 and PDGF-A have been implicated as possible field carcinogens [77–79]. Field cancerization can be initiated and propagated in many ways, including mutagen ROS . The chronic exposure of high extracellular H2O2 promoted the transformation of normal epithelial cells and fibroblasts, indicating the presence of a premalignant field defect by oxidative stress in the TME [81–83]. H2O2 is an ideal field effect carcinogen due to its higher cellular plasma membrane permeability and longer half-life than other ROS counterparts [7, 35]. H2O2 aggravates cancer cell aggressiveness, transform primary epithelial cells by oxidative modification of the membrane associated PTEN and Src proteins, decreasing PTEN and increasing Src activities [8, 35, 43, 84]. Normal fibroblasts treated with H2O2 transformed into an oxidative, CAF-like state. In turn, these newly converted CAF-like cells produced higher H2O2 caused by an impaired TGF-β signaling . These observations indicated that stromal cells, such as CAFs, engaged redox signaling circuitries and mitogenic signalings to reinforce their reciprocal relationship with the epithelial tumor, further supports that extracellular oxidative stress might act as a field effect carcinogen [35, 43]. Thus, ROS are atypical carcinogenic signals which promote stromal-mediated field cancerization .